If you're looking for some super durable backcountry backpacks full of features to get you, your snowboard or your skis and the rest of your gear to the top of the mountain safely and efficiently, check out some of the snowboard backpacks and ski backpacks we've got. Designed by snowboarders and skiers, these travel packs and bags have the features you need for long treks in search of perfect powder, but are also practical storage solutions when you're loading up your car for a weekend getaway to the local mountain. They're a fit for serious riders to beginners, and it doesn't hurt that they look great, too. 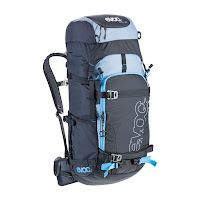 FR Pro Ski and Snowboard Backpack | EVOC: This travel bag is packed with features yet is still on the smaller and lighter end of the backpack spectrum. It comes in 3 sizes to fit you, ranging from 18 - 22 L in capacity. 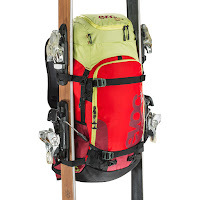 Main features include ski (on the side) and snowboard (on the front) carry straps and a removable back protector for treks when you're loaded with gear. Also - hip belt, avalanche equipment compartment, goggle pocket, ice axe loop, signal whistle, and is hydration system compatible. Black or green, your choice of color. 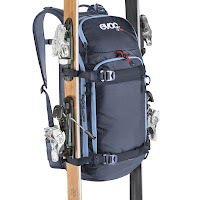 Patrol Team Ski and Snowboard Backpack | EVOC: If you're looking for a large ski and snowboard backpack, this is it. With 40 L of storage capacity, you can fit all the gear you need. It's a top end loading backpack too, so you can really pack it in. 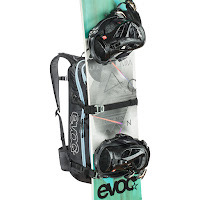 Snowboard and ski straps are both included so it doesn't matter what you're riding. The bag also includes many of the same features as the FR Pro, like removable hip belt, avalanche equipment compartment, and more. Check it out in black or a flashy lime/red/ruby combo. If you want a little trimmer pack, there's a 32 L version available too: Patrol Team Backpack 32 L.